WAPPINGERS FALLS, NY -- Two unearned runs and 11 runners left on base doomed the Hudson Valley Renegades as they lost game two of the New York-Penn League Championship Series to the Tri-City ValleyCats 4-2 in 12 innings Sunday evening at Dutchess Stadium. With the win, the ValleyCats become the 2018 New York-Penn League Champions by sweeping the best-of-three series 2-0. The 'Gades broke out on top in the first inning with two runs. Centerfielder Michael Smith started the frame with a walk, then moved to third on a bloop double to left by shortstop Ford Proctor. With runners at second and third with nobody out, designated hitter Erik Ostberg grounded to second to score Smith and move Proctor to third. First-baseman Jacson McGowan followed with a sac-fly to left, and the Renegades owned a 2-0 lead. Hudson Valley had a chance to extend the lead when they loaded the bases in the fourth with two out. However, Johnson grounded into a 6-4 fielder's choice to end the threat. Tri-City would come back with a run in the fourth, buoyed by a costly Hudson Valley error. Leftfielder Carlos Machado started the inning by reaching on a two-base fielding error from Renegades third-baseman Kaleo Johnson. A single to center by third-baseman Enmanuel Valdez moved Machado to third, before catcher Oscar Campos grounded into a 6-4-3 double play to give the ValleyCats their first run. Things that way until the seventh when the Renegades would boot away their lead. Campos started the inning by reaching second on a two-base throwing error from Johnson. He went to third on a groundout, then scored with a two-out lined single to right from shortstop Deury Carrasco to tie the game at two. It was the second unearned run of the game given up by Hudson Valley. The Renegades had an opportunity to end the game in the 11th. Hudson Valley loaded put runners at the corners with one away before ValleyCats reliever Manny Ramirez struck out pinch-hitter Adrian Rondon and rightfielder Jordan Qsar to end the threat. The ValleyCats took the lead for good in the 12th as a bunt single and two walks loaded the bases with two away against Renegades reliever Jack Labosky. First-baseman Alex Holderbach, who owned a .201 regular-season average and was 0-4 for the game, lined a two-run single to center to give Tri-City a 4-2 lead. In the bottom-of-the-12th, Hudson Valley's first two batters struck out and it appeared the game was over. However, Ramirez proceeded to walk the next three hitters to load the bases with two away. But fellow-reliever Jacob Billingsley was brought and got McGowan to fly to center to end the game. Each team had only five hits in the game, with Betts providing two singles for the only multi-hit performance. The win went to Ramirez (1-0) who fired 2.2 scoreless innings on two hits with six strikeouts and three walks. The loss fell to Labosky (0-1) who allowed the two go-ahead runs on two hits in three frames. He also walked two and struck out four others. The save went to Billingsley (1) who only faced one batter. 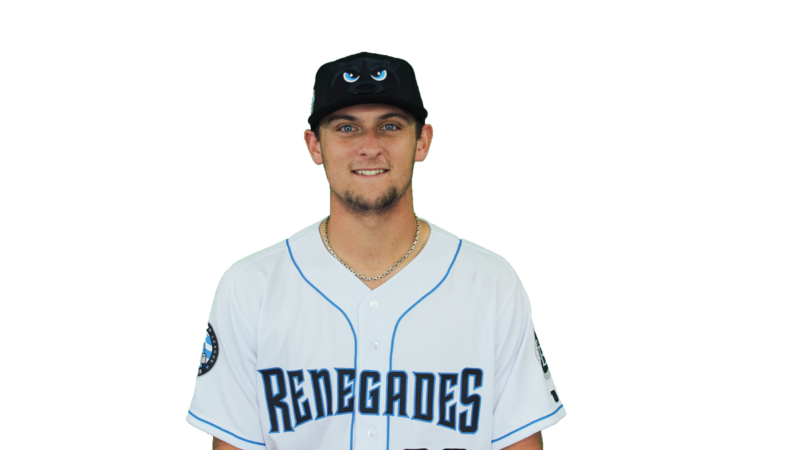 The loss ruined a solid start by Renegades starter Cristopher Sanchez who gave up an unearned un on two hits over five frames. Though he didn't figure in the decision, relief man Juan Pablo Lopez was sensational for the ValleyCats after he tossed 4.1 scoreless innings on a single hit. The Renegades end their season at 45-30 with a third consecutive trip to the New York-Penn League Finals. Tickets for 2019 are already on sale. For more information please go online to hvrenegades.com or call the ticket office at 845-838-0094.